If it's Friday we must be back in London. Every Friday I take a virtual walking tour ‘above ground’ on the London Underground. Using my Tube guide & my fitbit® device, my goal is to walk 10,000 steps a day roughly following along the Underground route, reporting back here on Fridays with my findings We're currently following the Central Line. Here are the previous days. This is Day 61. If it’s Friday, I’m usually taking an imaginary walk in London. Today I have to veer off course. Run, don’t walk—or take a train if you must, the Central Line is quite handy—to the Tate Britain where the museum is hosting an exhibit by Los Angeles’s favorite non-American artist David Hockney. We love the acclaimed British artist here in sunny L.A., in part because he loves us back, reflecting our city’s allure with paintings of sparkling pools filled with beautiful boys, the winding roads of the Hollywood Hills, California houses perched on hillsides, filled with light and color. Hockney, who turns 80 in July, continues to produce fresh new material, exploring genres and formats—video, photography, utilizing the iPad—proving you can indeed teach an old dog new tricks. Or the dog can teach himself. 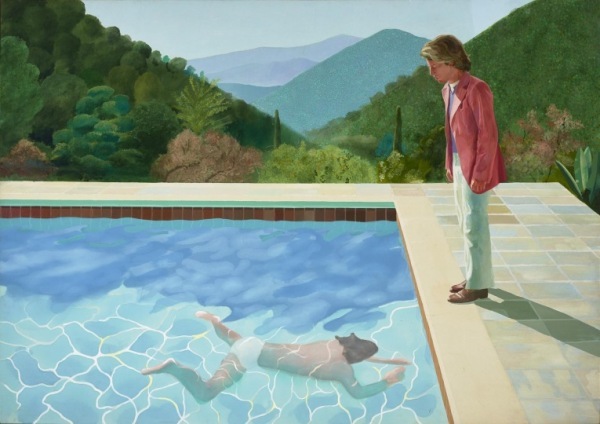 We are lucky in L.A. to have a few cherished Hockney’s to call our own. The mammoth Mulholland Drive: The Road to the Studio stretching across one entire wall on the third floor of the Art of America's building at LACMA is one of my favorites. Driving over Laurel Canyon to the Valley, passing Mulholland Drive in my own car, I’ve risked crashing into the hillside more than once as I pick out the landmarks depicted in the Hockney’s art. The Tate exhibition is a collection of 250 works, some of Hockney's most famous pieces of art along with some of his most recent work and is scheduled to run through May 29th. As my hubs and I try to decide if we can or can not make a trip to England, France & Italy this year, I’m putting this on the list of Reasons to Go Now! along with I'd like to go while I'm still young enough to do it, let alone enjoy it! Above Ground on the London Underground. That is indeed a wonderful detour, I like going to art museums and it's surely slim pickings where I live. Thank you for the suggestion of the P.D. James books. I love a series! Love those colors. 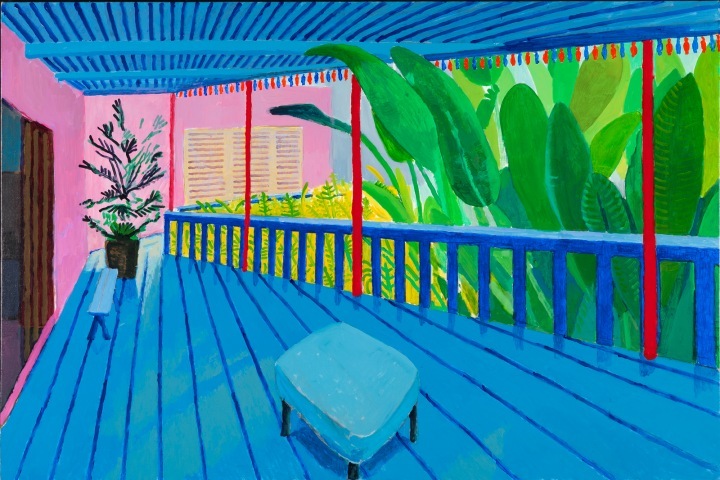 I looked into Hockney a few months ago, drawn to his photography, but I love his paintings, too.